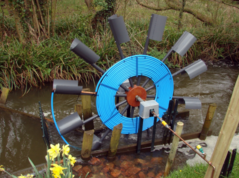 The paper “A hydrostatic model of the Wirtz pump” co-authored by Jonathan Deane and Jonathan Bevan has been published by the Proceedings A of the Royal Society of London. A link to the published version is here and a link to the pre-publication version is here. The Wirtz pump is an excellent example of sustainable technology that is amenable to novel mathematical modelling. Taking a dynamical systems approach in the paper, a discrete mathematical model is derived in the form of a mapping that describes its hydrostatic behaviour. The new model explains several aspects of the behaviour of the pump and is used to design a pump that gives approximately maximal, and maximally constant, output pressure. The photo shown above-left is a working model of a Wirtz pump in the garden of a famous house in Godalming.